The weather here in Seattle has been such over the top amazingness that it is really hard to believe it will ever get gross, but every time I mention that to a die hard Seattle dweller they get a little angry and tell me not to get too used to the sun. Terrariums are like a mini planet in and of itself. They are a fairly self-sustaining little ecosystem, and the less you mess with them the better. As the water evaporates from the soil it gathers on the ceiling of your terrarium and then drops back down onto the soil. It is best to use low growing, as well as slow growing plants so that your terrarium does not get overcrowded by an aggressive plant. Here is how to start your uber cool terrarium! Drainage to terrariums is key. So start it off with some decorative rock or marble on the bottom. Add a layer of charcoal, which will filter the fumes from the decomposing matter. Next is your soil- You should use something like a cactus mix to help with drainage. Next place your plants in a cute arrangement with any small object such as sticks, shells or mii statues. Make sure NOT to fertilize your terrarium, as you want to keep these guys slow growing and small. The first picture is from Design Sponge, the second is from Artmakers and the third from the love of my life Terrain. 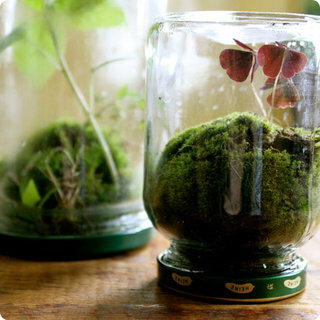 ******** If you live in the PA area please go to TERRAIN'S Terrarium Workshop on October 17th! I wish to the lord I could go, but it is just too far :( If you go, you have to come and tell me all about it so I am super duper jealous!!!! Bring your favorite plants into your home year-round with the help of special guest Tovah Martin, author of terrain's top-selling book The New Terrarium. Whether you are a seasoned grower or a novice gardener, this special workshop will spark your creativity to design a one-of-a-kind inspiring terrarium. Choose from terrain's wide selection of terrarium plants and from our numerous styles of glass vessels to create your garden. In this workshop, Tovah will share her years of experience growing and maintaining terrariums - introducing you to the whimsical yet practical world of gardens under glass. $15 per person; Fee includes lecture and instruction from Tovah, terrarium making supplies (Soil, Charcoal, Moss). Workshop fee does not include the cost of the vessel and plant materials. I seriously cannot wait to try one! It&#x27;s like something my mom would&#x27;ve been into when I was growing up- so hippie! Hippie-chick. That looks so cool! I might try to give a simple one a go with my kids this winter too. Thanks for the info! Fig Tree, the Terrarium is a GREAT idea!! If I still lived in Chicago, I&#x27;d be on this project ASAP! I like each of the terrariums you posted...pretty! I personally like the hanging one...I hang everything I can. I try to keep it in good taste but get carried away every once in a while! I think I&#x27;m going to give this project a go with my kids...I think they&#x27;ll really get into it, especially the enclosed one. Keep us posted on your progress...can&#x27;t wait to see!